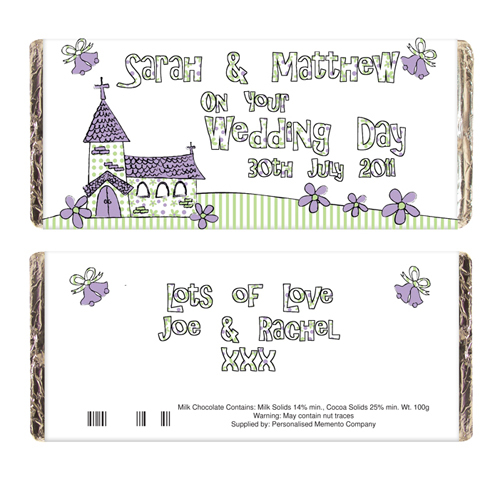 This wonderfully colourful and bright personalised chocolate bar truly makes a perfect token gift for the Bride and Groom. Personalise the front of the bar with the bride and grooms first name up to 20 characters (please include the & in your personalisation if required) and date up to 15 characters. Then personalise the back with your own message over 3 lines (up to 20 characters per line). Personalise the front of the bar with the bride and grooms first name up to 20 characters and date up to 15 characters. Then personalise the back with your own message over 3 lines (up to 20 characters per line).